The holiday fishing season has drawn to an end and it’s been a great few weeks. Not just seeing some stunning fish on the bank but being part of making people's holidays such a memorable time. 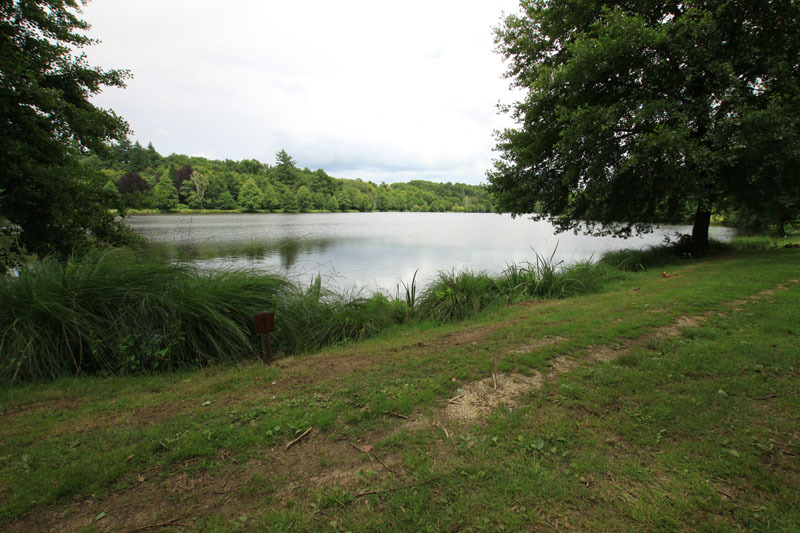 We have a lot of families with children here over les vacances and, with our own children on site, Ribière a place where the children can enjoy the pool, trampoline and play area whilst the anglers catch some special fish. It’s also great to see people mix from all over Europe - Dutch, English, French, German and Spanish. 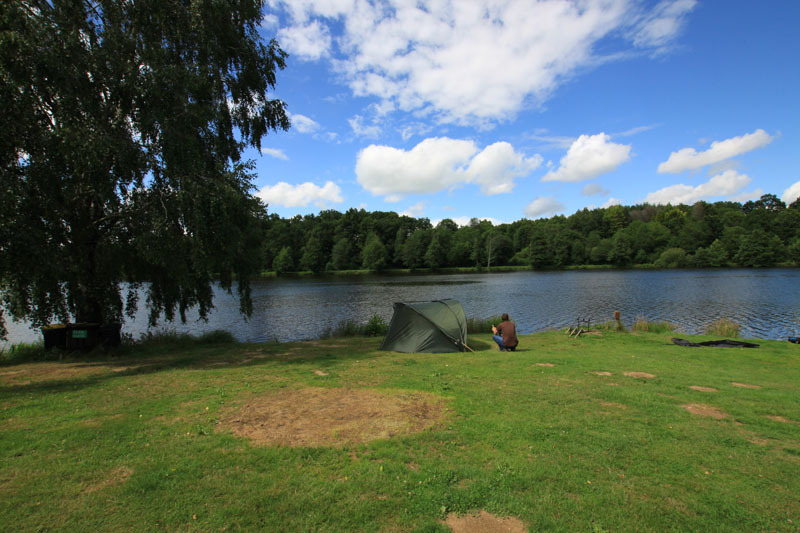 Our plans over the next few years are to ensure that the children and families have as much to do and places to visit as the anglers in the party. 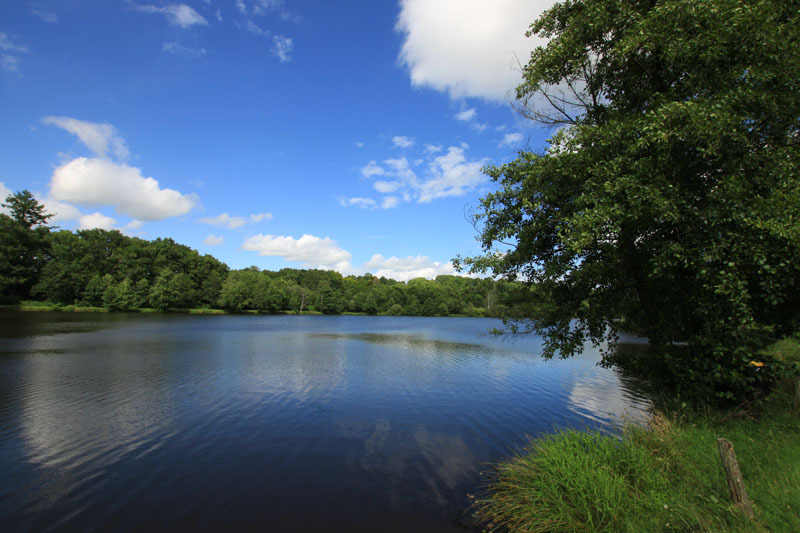 So we are putting together some new visitor books so you will be able to enjoy the local attractions, which include the zoo, go carting, canoeing and visiting some of the public lakes which offer great family facilities including swimming, slides, play areas and much more. August has been quite challenging this year. I can honestly say that anglers have had to work very hard for the fish they have caught. The weather has been consistently hot, at times over 32 degrees but on the cooler days, the fish have got on it and fed. The last week of July started very hot. With only six French anglers fishing (all regulars) the fishing really slowed. The fish moved into 8 and 9 to enjoy a relaxing week with no one fishing at this end. This ended up the poorest week of the year with only 10 fish caught. The fish were feeding but for short periods. The anglers all caught but it was hard work for a few fish each. The biggest problem for me was the lack of pressure all over the lake and the fish just moved away from everyone. The second week improved slightly with around 25 out and again everyone catching. 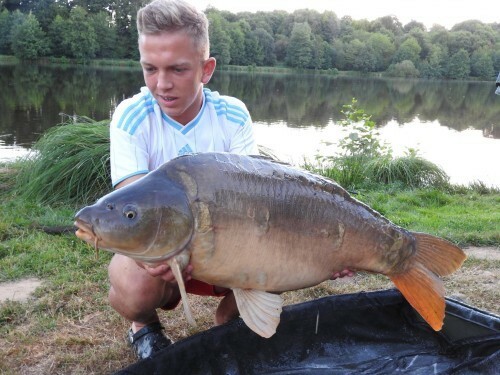 But the fishing was difficult to say the least, the best 21.5kg. Infact, it was the small fish that were getting caught. Everyone caught and the fish were moving all over the lake but it was hard going. You know its tough when anglers like Alex Chat and Julian Filleul also struggle. But the slow fishing was more than made up by the great atmosphere and relaxed social environment enjoyed by all. 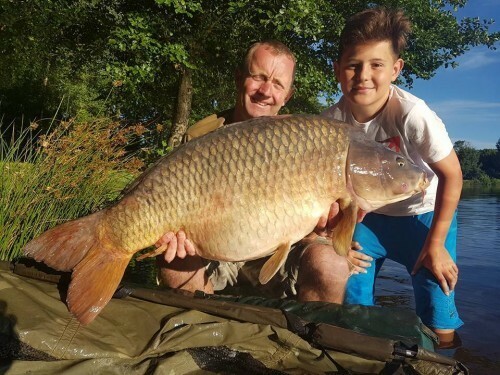 The start of the third week was something special for one of our regular French anglers, M. Callemeyn, with Alex coming out on Saturday during the changeover at 65lb. Which tells you a lot in itself. Our angler was doing two weeks and was fishing on his spots when Alex moved in. I think quite simply Alex made a big mistake thinking all was clear. 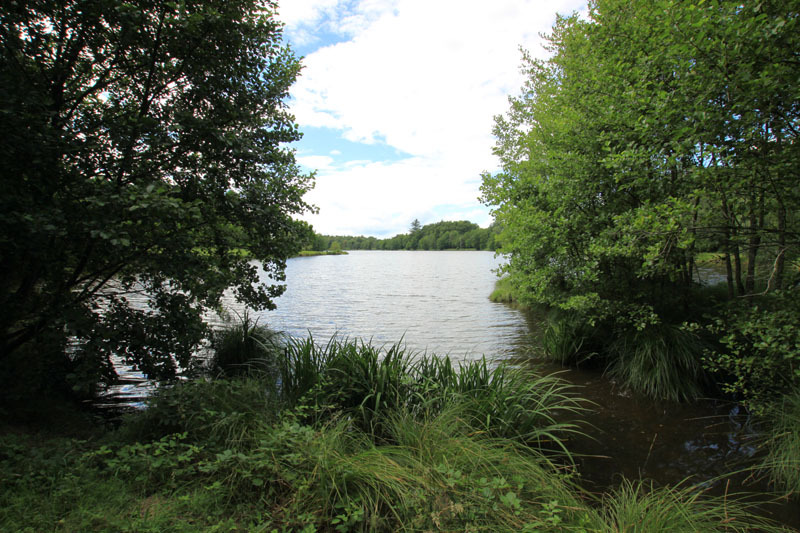 When you see a lake every week, you see the fish feeding every Saturday without fail – they know it’s safe, most of the time. But the week unfolded with more fish than previous weeks and some bigger fish being caught to 22kg. With all the lake catching and over 40 fish out for the week. Nothing particularly big with the exception of Alex. But a much better week which continued. The following week was a great group of lads from the UK led by Mark Johnson and two great Dutch families staying in our wooden chalet and fishing pegs 8 and 9. Lots of fish over 40lb out this week and again everyone catching despite difficult – hot, no very hot – conditions. Peg 6 continued to catch some nice fish as did peg 7, 8 and 9. Pegs 1 and 2 struggled as the fish seemed reluctant to move down to the deeper water. But again no real big fish to report. They seemed to be feeding but not for very long and not on anglers' bait. Lots of bubbling in the silt and milling around on the top. The last full week on August was almost a repeat of the previous week. With a ix of British, French and Spanish anglers, again everyone caught with around 30/40 fish out. Pegs 1 and 2 struggled but ended with a very nice 48lb common for Chris Trow from the UK after all their efforts. It was a much better week with over 50 fish out. Pegs 3, 4, 5, 6 doing very well and catching three or four fish every night. It was almost stop start, as the weather cooled the fish fed and when it was hot they milled around on the top. 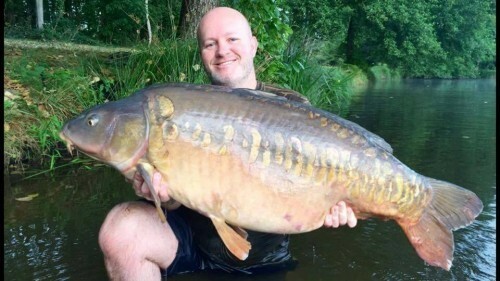 The exception was again peg 6 which seemed to spring to life for a few days and then go quiet but produced two of the biggest of the week with a nice 40lb fish and then Black Spot out at 25kg to Alberto Sanchez from Spain. So a very good end to August. Fish all over the lake some bigger fish coming out and everyone happy. The final few days of August and into September finished with a bang. 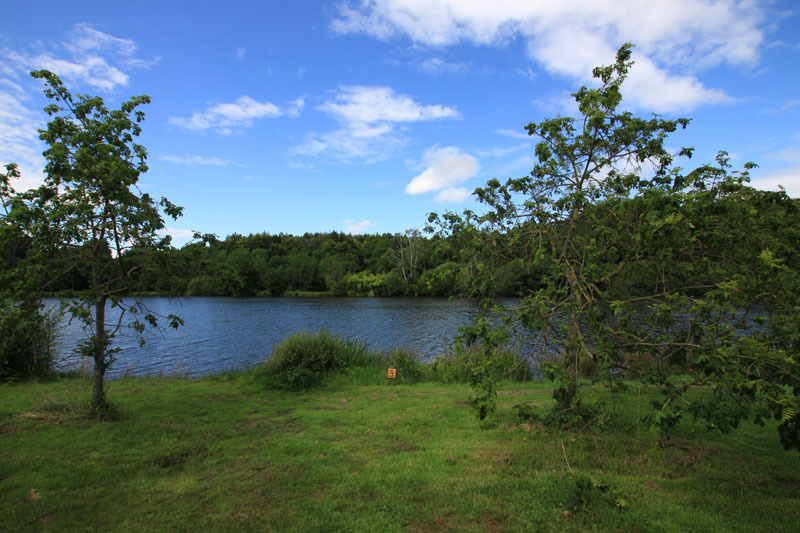 The weather changed on Saturday with 22 degrees down from 32 degrees, rain, cloud and wind turned up for the first time in eight weeks and the fish had a good proper feed. The result on Saturday and Sunday was everyone caught. 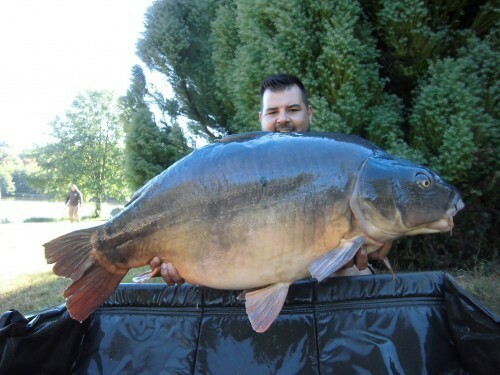 Peg 8 with the best at 49lb within hours of casting out for our Spanish anglers Garcia and Ordonez. Peg 1 and 2 (Kevin and Greg Lewis from Manchester) were also off the mark with some good fish and a couple of nice fish from pegs 5 and 7 for a UK group of anglers led by Lee Goodman. And pegs 3 and 4 also catching very well after a frustrating start to the week with Laurence Townsend and Brendan. Then the fish grouped up big time in pegs 1 and 2 and the lads there had a great session. 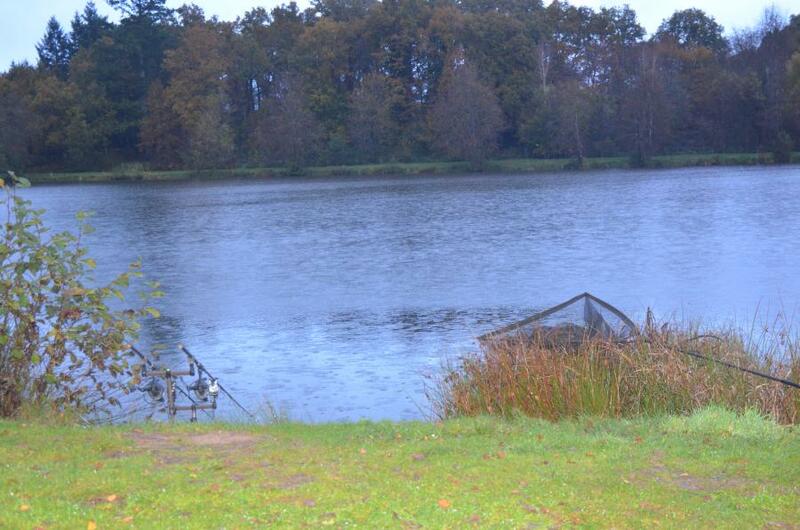 The fish hadn't been in pegs 1and 2 in big numbers for several weeks, seeming to prefer 6, 7, 8, 9 but that’s fishing. Kevin and Greg finished the week with 35 fish to 63.10lb including the stunning big linear and 14 over 40lb including two at 49lb, a 48 and a 47. A special session for twins Kevin and Greg. The linear had tail damage in April when it was caught at 56lb which to my amazement had fully recovered and the fish looks mint. This shows that the fish are going into the Autumn only slightly down in weight from their April and May weights and looking stunning. What will the Autumn hold for us?! 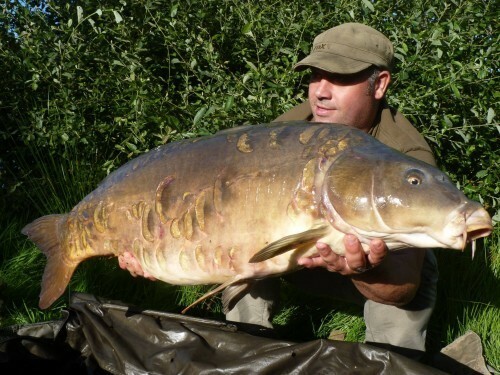 For me, it’s been great to see how well our boilie has done over the summer months. The last week is a good example. The fish seemed to be looking for it. Those that were using it caught a lot more fish than those that did not and it out fished Cell and Hybrid. A good quality fishmeal in the warmer months is always a good bet. So please do not neglect using our bait. It's quality and we supply it to ensure the health and wellbeing of the fish, not to make money. I am also using a special amino blend for the colder months. It’s a proven feed stimulant and releases in colder conditions. I simply can’t wait for the cooler weather to come and for the fish to start feeding more often and for longer. I think we are in for some stunning big fish hits. 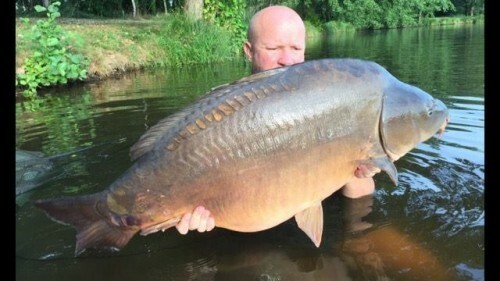 I posted on Facebook over 25 fish which have been out at 55lb plus to 72lb. 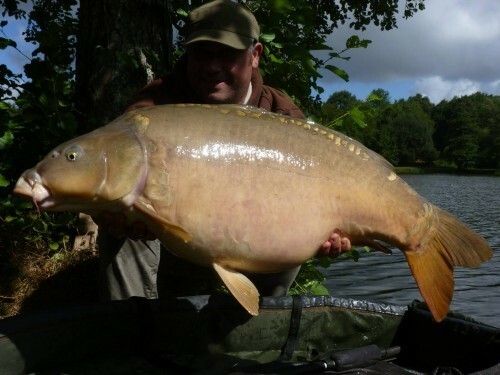 We have had six different fish over 60lb and some fish very close to 60. I think all the fish in the weight class can go bigger and we have still not seen some of our other 60lb fish being caught. Julie has remained elusive and most people seem to think she is no longer with us. I have spent a lot of time walking the bank and finding fish and I believe I have seen a fish close in hiding in snags which is bigger than Alex so we will have to wait and see. But, I repeat, we have not found her dead. If we do I will tell you all. So for me she is still here and until we drain down or she gets caught we shall just have to wait and see. But please remember that the big fish are very clever and can often go for long periods without being caught. I am very excited about the Autumn and am hoping for a mild October and November. I have fished here myself in November and it can be a great time of the year. This year we have Fox coming to shoot a DVD and to share their experiences of winter fishing on a big fish water. I hope the weather is kind to them and we get some great footage of some of the bigger fish for you all. As always, please feel free to give me a call as I am happy to let you know how it's fishing and the going methods. If there is one thing that I can’t live with, it's poor fish care on the bank. I have now put in place all mats and appropriate slings and nets for you all to use. Please do not bring any with you from September. I am also providing fish care kits. Ask me and I will demonstrate how I expect you to use them. Two things that I am finding frustrating are anglers keeping fish in retaining slings for long periods. Please do not do this. And using inappropriate end tackle including fixed leads, big hooks over a size 4 and heavy line. You don’t need anything bigger than a size six hook, you should be dropping your leads or pushing the rubber on so that it can come off and your line should be no more that 18lb. I use 16lb a size 6 or 7 hook and MCF dumper clips, with tubing. As you all know leaders are no longer accepted. You should all be on tubing. If you break any of the rules relating to fish care you will be asked to leave. Please also note that keeping fish out of the water for long periods of time whilst you faff around looking for your scales and camera will result in me releasing the fish and you going home early. I am contemplating moving to barbless hooks for next season. Oh and one last thing. This year will be the last you can use maggots. Please observe the required amount. In my view they have proved less successful for anglers over the last year and it pushes the fish onto naturals at a time they need to be on high quality bait. We are getting quite full for 2017 and 2018 is also very busy. Yes, this is true! So don’t delay if you are thinking about a trip don’t leave it to the end of the year, book it now or you will not get on.